We usually showcase concepts of smartphones, not software or UI, but this time we’ll make an exception. Jonathan Larradet has rendered the Google+ experience on the Motorola Moto 360 smartwatch. Its design has already appeared on the web a bunch of times. It appears that Moto will keep it simple and simply create a metallic circular design, strapped to a minimalistic belt. The proportion of screen versus body for this device goes to the direction of edge to edge, if we can call a circular surface that way. It’s incredible how crisp this display is, both in the official renders and concepts. 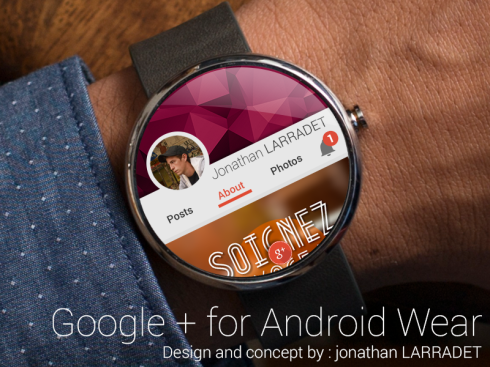 Back to Jonathan’s concept, he proposes a swiping interface and the ability to scroll content vertically on your Google+ account. Basically he tries to keep the general Google+ interface from the phone and only scroll through it. I’m guessing Google could make it all smaller and more minimalistic, with bigger and clearer elements to tap. It’s true that the UI would be less flashy, but it would work faster and those big icons will be easier to tap. Do you want flash or comfort? Samsung Galaxy S5 Prime Gets a Detailed Series of Renders (Video) iPhone Plus Rendered by Faisal Semari Stands Apart from the Crowd!